An arrest has been made in the fatal shooting of a 27-year-old man at an apartment complex in Arlington Sunday night. 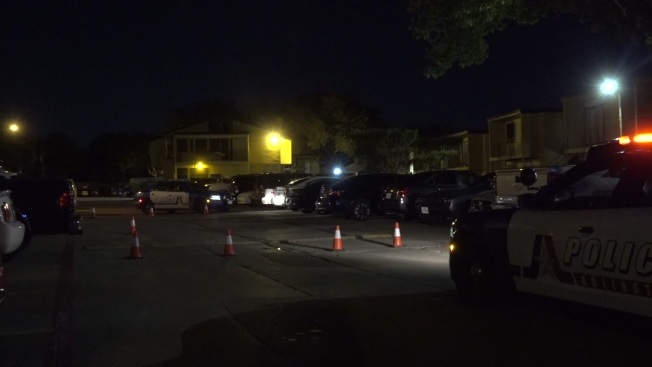 Arlington police were called to a shooting at the Indian Creek apartments at 2712 Indian Creek Drive at about 9:30 p.m.
Officers arrived to find a man, identified by the Tarrant County Medical Examiner as 27-year-old Christian Cruz, with apparent gunshot wounds. Cruz was hospitalized where he later died. Arlington police said Monday morning that they identified Reymund Ruiz as a suspect in the murder and that he was taken into custody earlier in the morning without incident. Ruiz has been booked into the Arlington City Jail on a charge of murder. A bond amount has not yet been determined and it's not clear if he's obtained an attorney. Police have not revealed a motive for the shooting, but did say their was a disturbance at the apartment prior to the shooting. Arlington police are also investigating a second fatal shooting that took place at about 11:45 p.m. Sunday less than a half of a mile from the Indian Creek shooting. Police said Monday afternoon they do not believe the cases are connected.